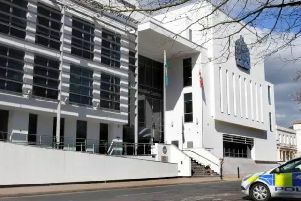 A young man has told a jury he grabbed a knife as he fled from his mother’s home near Warwick because he feared her partner was going to kill him. Warwick Crown Court has heard that outside on the patio Jack Merrilees then stabbed Eddie Cornet three times to the chest, with one wound going straight through his heart, killing him. Edward Cornet, known as Eddie, died of his injuries in hospital in the early hours of the morning after the stabbing at the home he shared with Merrilees’ mother in Blackwell Lane, Hatton Park, at shortly after 11pm on May 2 last year. Tearfully giving evidence, Merrilees was asked how he found his mother’s partner, and replied: “He didn’t seem too bad at the start, like a normal guy. He said he lived with his girlfriend Rebecca Beveridge in Leamington and only saw his mother about once a month because he ‘did not really want to see Eddie,’ but had previously lived with his mother and Mr Cornet at an address in Kenilworth. It was while they were there that he first saw violence towards his mother after he had got back from work late at night. “I could hear shouting, and as I opened the door he had my mum against the wall by her throat. She was terrified. I tried to get him off by punching him and grabbing him. Merrilees said Mr Cornet then headbutted him before being dragged outside - and when he later returned to his mother’s home he said he could hear shouting and smashing, so called the police who took Mr Cornet away. He said that on another occasion Mr Cornet had flown into a rage when he and two friends drank some of his bottle of Coke. They first went to a pub in Warwick where he and Mr Cornett had two pints each, and then to an Italian restaurant in Leamington where the two of them drank bottles of Peroni. On the way back to Hatton Park, they stopped at a bookies for Mr Cornet to put a bet on a boxing title fight taking place that night, and after they got back they streamed some boxing and extreme fighting videos from Becky’s laptop onto the television. Merrilees, who said he and Mr Cornet were drinking bottles of San Miguel, said the rest of them were not particularly interested, but Mr Cornet was really enjoying the videos. Mr Cornet’s anger, which took the others by surprise, was because Josh had not bought him a drink on New Year’s Eve. Merrilees said he ‘clicked his face off the screen,’ but when he went back onto Facebook, instead of the page having ‘refreshed,’ Josh’s face was still there. “He put all his weight on top of me. Merrilees said that after running through the gate with the knife in his pocket, he heard a scream. “I’m sure it was from Becky. It made me think she was in trouble and I ran back. Eddie was right in front of her. “I threw a punch at him in his face. I didn’t want him to hurt Becky. I wanted to take him from trying to hurt Becky and let them get away, and he turned on me. Crying, he said: “I was petrified. I thought he was going to try to finish off what he’d started in the living room. “I shouted at him and warned him. I think I said I would stab him if he didn’t leave me alone. I was holding the knife in front of me. I must have stabbed him.